I have talked about customer service and how to keep customers coming back. I have even talked about sales hiding your mistakes, but what do you do when you don’t have sales? How do you hide your mistakes when the customers are not coming through the doors? It is hard finding the motivation when the sales just aren’t there. When the sales are down, hiring freezes kick in. With a hiring freeze each employee is asked to pull more than their own weight. Everyone is so busy they forget to say thank you. Those missed opportunities for leaders to say thank you lead to the remaining employees starting to feel overworked and underappreciated. So how do you stop it? Controlling the spiral takes a lot of effort that most big organizations don’t take the time to make. Finding motivation for employees who just had their hours cut takes talented leaders. Years ago I had the chance to work with such a leader. Store sales were in the toilet and associates that had been working 30-40 hours a week were cut down to 4-8 (I was one of them-barely paying my rent while going to school), full time associates were “encouraged” to take half days of vacation or unpaid off without penalty to save payroll and spirits were low. So this leader hit the sales floor and turned customers into a challenge. Each associate (including our normally office bound leaders) in the store was tasked with being a personal shopper to those few customers we had. Tasks were second to being the best customer care associate you could be. If that meant walking them to light bulbs and helping them chose, you did it. If it meant debating the power of this saw versus another, you did it. If it meant escorting them to the bathroom you did it. You stayed with that customer and made sure they found everything on their list and more. You got a ladder and pulled the box off the top shelf for them. You adventured through the chaos of receiving and into the back room to get the colour they wanted. You made sure they knew your name when they left. You made sure they knew people would help them when they came in. You made sure they were going to come back. Then, when the floor was dead we went back to tasking. It took a few weeks. They were hard weeks with more tasks than staff, but sales started to turn around. Average ticket went up. We got more hours on the floor giving us more time to do tasks, and we just kept helping people. The customer came before getting the stuff put away, and the stuff still ended up getting put away because when someone needed something you were right there to get it for them and leave the rest on the shelf for the next customer. In the end, we can live without all of the tasks “we think are important” being accomplished, but those tasks don’t matter if we don’t help them buy the stuff in the first place. Sales can be powerful, but when sales aren’t as high and customers aren’t crashing your site with traffic or blocking your aisles to get to the register, sales are still out there if you focus on the customer’s needs before your own. This is an old adage that comes from my home in the retail world. My entire career has been focused on getting customers to buy stuff in one form or another, whether it comes via driving them through a conversion funnel online or motivate them with the right price in a flyer to come into a store and lay down their credit card. A little while ago I talked about customer service and how sometimes you have to break up with bad customers. While I believe this is true, I still think you need to love and support your customer or client through your entire relationship. Their dollars pay your bills. You get to do fun user experience tests and cool projects with YOUR brand because of THEIR dollars. When you make (or have made for you) a bad buying, pricing or inventory choice those high turning, high selling items balance the scales and hide your mistake. The business P&L still appears balanced and all is right with the world because there are items offsetting your error. If there are no sales those mistakes become magnified. There is nowhere to hide the mistake and you are left with what could be a career ending issue. Sales are like a drug. Each dollar, transaction, swipe of a credit card is its own little high for you and your team. It makes you want more. You become motivated to find a way to get more sales or to drive the average ticket. If there are no sales, it becomes a sad hollow shell of a team. They slow down, stop caring, pay less attention and sooner than you think have less desire to produce. Sales put hours on the floor. Hours on the floor help you sell more stuff. When there is someone there to read the box to the customer they are more likely to buy it. When there is someone there to ensure the customer leaves with a complete project of items (eg: brushes and tape with paint) they spend more and are less likely to spend at your potentially closer competitor. As a perk they often also come back because you treated them well. Hours on the floor make everyone feel like they aren’t alone. Even if an associate is run off their feet they will keep going when they see others doing the same thing. Associates helping customers drive more sales. It always comes back to this. In ecommerce great product content, a good FAQ list, quick response to a help email or actually answering the 800 number mean that the customer feels like you took care of them. They complete their transaction. In a retail store it can be about being willing to get the ladder, or walk them to the product that makes them engage. In the end we know that sales make us feel better, but it is taking care of the customer that truly drives sales. Retail success both online or in store is about a few simple tactics. You don’t need to have the sexiest system, the best floor plan or website. You have to know what they are looking for and work to fulfill those needs. I have been in eCommerce for well… a long time. We work hard getting a customer to that first purchase transaction and it is definitely not easy to push them all the way through their first purchase, let alone a follow up purchase. Great looking sites and navigation can only go so far, but amazing customer service has unlimited ripples for any site. This week I had an incredibly positive first time shopping experience at rollergirl.ca. I created an order and asked for sizing confirmation in my special request box. I received a confirmation email stating my order was received and I would hear back from someone to confirm my order sizing. I received an email with the details regarding confirming my sizing supported by a link to the site with additional information and pictures. Pictures are always key to doing a good job of measuring for any apparel or footwear purchase. I responded to the sizing questions via email. I confirmed via email that they should go ahead as suggested. rollergirl.ca let me know that I would recieve a shipping notification from Canada Post shortly. Monday there was a notice for pick up from Canada Post. Monday night I had my skates and accessories in my hands complete with the addition some instructions on care, a cheeky rollergirl.ca sticker-I am still five years old and love stickers-and some Double Bubble Gum (comic and all). This is the example of surprise and delight. I had gone to rollergirl.ca because they had a richer assortment than my local Toronto store. I really wasn’t expecting to get anymore out of the experience than the particular size and model of skates that I wanted. Instead what I received was the definition of customer service and I will continue to shop there because I was blown away by the speed and quality of my service over and above getting my product of choice. Now let’s be honest, not every scenario plays out quite this quickly. I really wanted my skates and was refreshing my email like crazy while waiting for the feedback from Roller Girl, BUT… that is what makes it even more special… they responded pretty much right away every time. Hmm.. you say that there was a couple of hours between my order and them confirming sizing… not really. The store is Vancouver based and they weren’t even awake yet when I created my order. Formally the store doesn’t even open until 10:00am PST time (1:00pm EST) and I really wasn’t expecting to see a response before store hours. This is what fills a customer with surprise and delight. I was surprised at the service on Friday. I am delighted with the perfect sizing today and will continue to shop and be an ambassador for the store forever based on this experience. We live in an environment where every known fact is up for a new release any day. If we were high school science teachers the only significant change in the space of an entire career is the fact that a new element was added to the periodic table, or a planet is no longer a planer. Instead today in eCommerce we have items like HTML5 and CSS3. Named as such because they had predecessors and are guaranteed to have shiny new versions in the near future. You as a digital professional need to know (and accept) that you can never know everything, and if you aren’t willing to upgrade your own knowlege and skills, you too will become outdated in less time than you think. We choose eCommerce because of and not in spite of these facts. They keep us humble. They inspire agility and lifelong learning. Sometimes they require us to accept failures. We can’t always plan for volume, demand, customer engagement. Sometimes we have to apologize for making mistakes. In light of the holiday season I am proud of some retailers saying the simple words “We’re Sorry”. Black Friday is hard. Cyber Monday is harder. If your merchandisers did their job you have the right assortment. If your marketers did their job you have the right traffic. If your technical team did their job your site can handle the volume. If you can say yes to all of these statements I congatulate you. You are rare and precious. What the reality is for most is that one or two of those statements are true and you are left with one broken item. Your site went down from volume. Your traffic sucked because your message wasn’t clear. You didn’t sell anything because your assortment/pricing weren’t on target. Option 1-Own the issues, apologize to your customers and learn from your mistakes for next year. Option 2-Pretend they didn’t exist and hope your customers don’t hold it against you. Most retailers hide under the guise of Option 2. 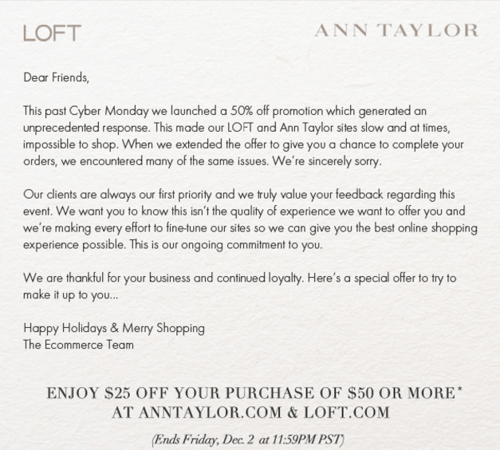 Today I would like to credit Ann Taylor for choosing Option 1. Their site couldn’t handle the Black Friday volume. They tried again and still couldn’t handle it. After a couple of tries they sent their customers an email saying they were sorry and offering an additional discount. In the end what I will remember as a customer is not the outage, it is the apology and more importantly the discount. They have pushed my loyalty up a notch just by being honest. What makes the inner merchant in me happy is the fact that they have also managed to stretch the short window of Black Friday/Cyber Monday offers into an extra few days of sales making next years comps easier to plan for.